A balance between sensitivity and sensibility is required and this balance comes from meditation. Essence: Sweet children, the Father has come to change thorns into flowers. The biggest thorn is body consciousness. It is through this that all other vices come. Therefore, become soul conscious. Question: Due to not understanding which of the Father’s tasks have devotees considered Him to be omnipresent? Answer: The Father is the One with many forms and, wherever there is a need, He enters any child in a second and benefits the soul in front of that one. He grants visions to devotees. He is not omnipresent but is a very fast rocket. It doesn’t take the Father long to come and go. Due to not understanding this, devotees say that He is omnipresent. 1. In order to become worthy and sensible, become pure. Do service with the Father in order to change the whole world from hell into heaven. Become a helper of God. 2. Renounce the systems of the iron-aged world, the opinion of society and the code of conduct of the family and observe the true code of conduct. Become full of divine virtues and establish the deity community. Blessing: May you be truthful and, with the foundation of truth, give the experience of divinity through your face and your activity. In the world, many souls are called truthful or consider themselves to be truthful, but complete truthfulness is based on purity. Where there is no purity, there cannot be truth. The foundation of truth is purity and the practical proof of truth is the divinity on your face and in your activity. On the basis of purity, there is naturally and easily the form of truth. When both the soul and body become pure, you would then be said to be truthful, that is, you would be a deity who is filled with divinity. Slogan: Remain busy in unlimited service and there will automatically be unlimited disinterest. प्रश्न:- भक्तों ने बाप के किस कर्त्तव्य को न समझने के कारण सर्वव्यापी कह दिया है? Prashna : – Bhakto Ne Baap Ke Kis Kartavya Ko Na Samajhne Ke Karan Sarvavyapi Kah Dia Hai ? Uttar : – Baap Bahurupi Hai, Jaha Aavasyak Hoti Second Mei Kisi Bhi Bacche Mei Pravesh Kar Samne Vaali Atma Ka Kalyan Kar Dete Hai. Bhakto Ko Sakshatkar Kara Dete Hai. Vah Sarvavyapi Nahi Lekin Bahut Teekha Rocket Hai. Baap Ko Aane – Jane Mei Dairi Nahi Lagti. Is Baat Ko Na Samajhne Ke Karan Bhakt Log Sarvavyapi Kah Dete Hai. 1 ) Layak Aur Samajdar Banne Ke Liye Pavitra Bannna Hai. Saari Dunia Ko Hell Se Heaven Banane Ke Liye Baap Ke Saath Service Karni Hai. Khudayi Khidmadgar Bannna Hai. 2 ) Kaliyugi Dunia Ki Rasm – Rivaz, Lok – Laaz, Kul Ki Maryada Chod Satya Maryadaon Ka Palan Karna Hai. Daivigun Sampann Ban Daivi Sampradaye Ki Stapna Karni Hai. Dunia Mei Anek Atmae Apne Ko Satyavadi Kehti Va Samajti Hai Lekin Sampurn Satyata Pavitrata Ke Aadhar Par Hoti Hai. Pavitrata Nahi Toh Sada Satyata Nahi Rah Sakti. Satyata Ka Foundation Pavitrata Hai Aur Satyata Ka Practical Praman Chehre Aur Chalan Mei Divyata Hogi. Pavitrata Ke Aadhar Par Satyata Ka Swarup Swatah : Aur Sahaj Hota Hai. Jab Atma Aur Sharir Dono Paavan Honge Tab Kahenge Sampurn Satyavadi Arthat Divyata Sampann Devta. Slogan : – Behad Ki Seva Mei Busy Raho Toh Behad Ka Vairagya Swatah : Aayega. यदि आपके पास Hindi या English में कोई article, inspirational story, Poetry या जानकारी है जो आप हमारे साथ share करना चाहते हैं तो कृपया उसे अपनी फोटो के साथ E-mail करें. हमारी Id है::- kmsraj51@yahoo.in . पसंद आने पर हम उसे आपके नाम और फोटो के साथ यहाँ PUBLISH करेंगे. Thanks!! मैं अपने सभी प्रिय पाठकों का आभारी हूं….. 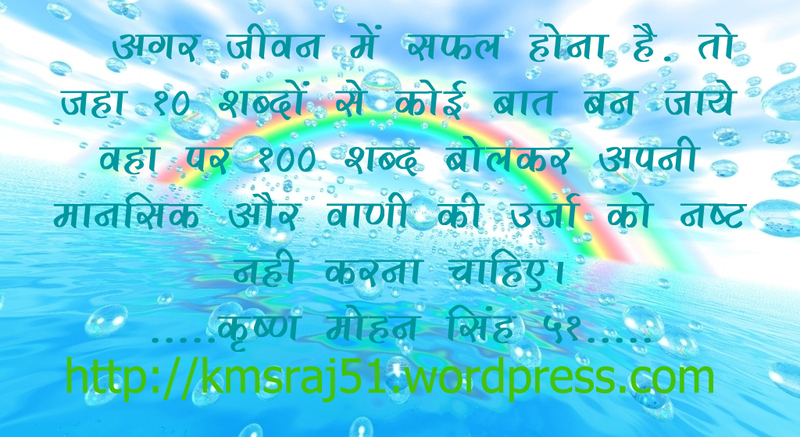 I am grateful to all my dear readers …..
@2014-all rights reserve under kmsraj51. Qualities, Peace, Truth, Happiness, Virtues, Love, Purity, Power and Bliss !! 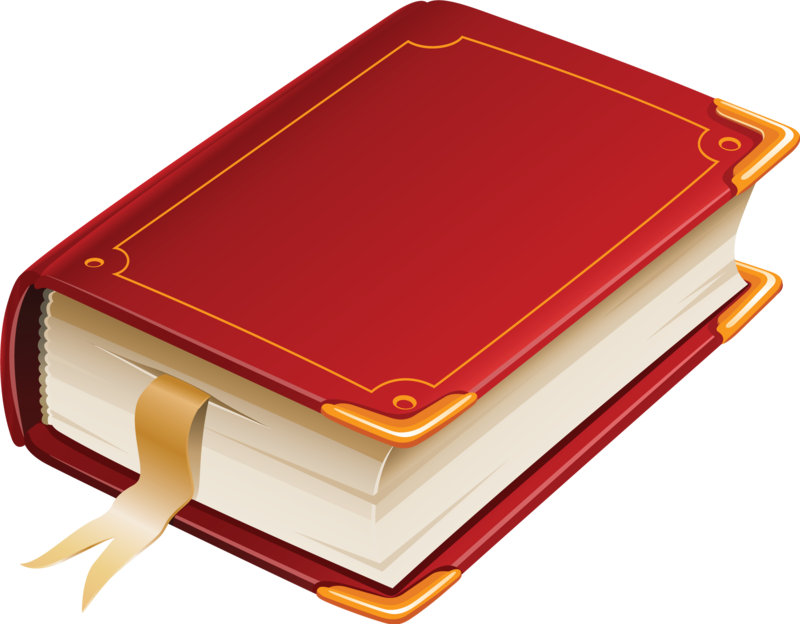 Innate or basic characteristics are properties that are unchangeable. It’s impossible to take the heat out of the sun or sweetness out of sugar. Heat and sweetness are part of the unchanging make-up of the sun and sugar respectively; they are the basic properties of each of them. In the same way, in spite of whatever I have become as a human individual, my deep basic characteristics are still the same ones that have always existed in me. It’s my inner core of qualities that in fact inspires me to seek the ideal in whatever I do. The impulse to seek and to dream comes from my own store of innate attributes that is just waiting to be found and brought into practical activity. The innate qualities of the soul are those that are the most basic: Peace, Truth, Happiness, Love, Purity, Power and Bliss. They are so basic that they themselves are the foundation of all virtues and powers. They are like primary colors and virtues and powers are secondary colors. Just as orange (a secondary color) is made of red and yellow (both primary colors) and blue is made of yellow and green, virtues such as patience, tolerance, courage, generosity etc. and powers, are obtained by mixing the basic qualitiese.g. The aim of meditation is to emerge and enhance my qualities so that my behavior becomes full of virtues andpowers. To do something altruistic each day is to ensure happiness. Expression: When there is the thought to do something altruistic for someone every day, there is the ability to give happiness unconditionally. Whatever the relationship or whatever the personality of the other person, the one who develops the habit of doing this, is able to remain a source of support for those around. Experience: The best gift I can give is to give happiness and to finish sorrow. When I am constantly thinking of this, not for any reward but just for the sake of it, I am able to discover and enjoy the fruit of that action. I am free from expectations and am able to enjoy the action itself. यदि आपके पास Hindi या English में कोई article, inspirational story, Poetry या जानकारी है जो आप हमारे साथ share करना चाहते हैं तो कृपया उसे अपनी फोटो के साथ E-mail करें. 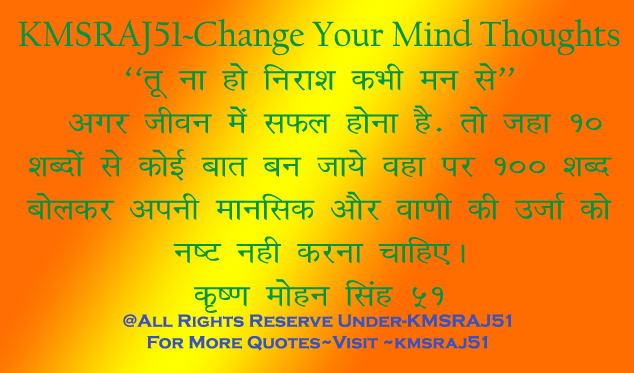 हमारी Id है::– kmsraj51@yahoo.in . पसंद आने पर हम उसे आपके नाम और फोटो के साथ यहाँ PUBLISH करेंगे. Thanks! !